This installment of the Lost Lore-series clocks in at 12 pages, 1 page front cover, 1 page editorial/ToC, 1 page SRD, leaving us with 9 pages of content, so let’s take a look! So, domains – in theory, they are supposed to depict a certain theological focus for the respective deities and their servants; in practice, that does not translate too well, though. 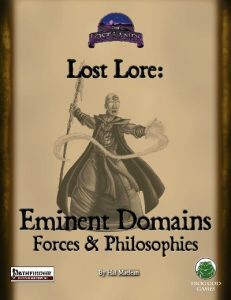 There are subdomains and Rogue Genius Games’ exalted domains as a means to further emphasize particular concepts. This pdf features a different, multi-pronged approach to the subject matter – in short, there are 3 feats: Domain Affinity grants you an at-will SP as part of preparing a given domain spell. As soon as you cast the respective domain spell, you lose the SP, rewarding players for not casting the domain spell at once – which is a pretty cool idea, considering how these spells usually are pretty powerful when compared to the standard list. Here’s the thing – the options gained actually are pretty intriguing! Characters with the air domain, for example, can, for as long as they retain the ability to cast obscuring mist, cause a creature within 60 ft. to move to an adjacent square on a failed save, potentially moving allies or foes – but, to retain balance, sans provoking AoOs. Generating an arbitrary symmetry in the actions of opponents, heating the feet of foes. The effects here are varied, creative and cool. The second feat would be Domain Channel, which provides a variety of effects – unlike e.g. Rite Publishing’s Divine Channeler or variant channeling, the respective benefits are more varied: For one, a domain has an automatic benefit: E.g. divine channeling by clerics with the Fire domain lets you suspend ongoing fire damage or fire/heat damage for a number of rounds equal to the channel dice. Now here is where the abilities get awesome – not only does the general framework manage to keep the complex rules-operation flawless, channelers with this feat may exchange channel dice for effects – each of the domains features effects for 1, 2 or 4 dice to be exchanged. Good clerics could e.g. make all evil targets glowing evil for one die as though seen through detect evil. For 2 dice, you can generate an anti-evil somewhat sanctuary-like bubble. For 4 dice, you may add a bonus to atk and checks made against evil targets, with bonus depending on aura-strength. The benefits provided here add fun flexibility and resource-management to the channel mechanic beyond anything I’ve seen so far and does so with panache, elegance and no fear of complex concepts. Finally, Domain Loyalty allows you to gain a unique benefit governed by the domain whenever you only prepare domain spells from the domain. These include airy rivulets that can carry objects and keep them in easy reach, gaining minor benefits (with a flexible choice) when provoking an AoO and similarly unique tricks. These feats are NOT the end, though – the pdf also sports 3 spells: Fast Favor (1st), Borne for Battle (2nd) and Battle Benediction (3rd). The first two spells are personal, while the third can affect a creature touched. Like the feats, each of these spells has a completely unique effect for the respective domains: Fast Favor for the air domain, lets you blast with agile jumps around, while borne for battle adds bull rush to attacks. Finally, battle benediction even nets you an extra 5-foot-step and manages to get the complex rules-operation required right. Oh, but that’s not all: The domains featured here also have a variant holy/unholy water included – earth, for example, nets a gunk that causes those that step inside to treat any terrain as difficult terrain. Patient coals wherein the embers still smolder can also be found here alongside black and white standardized sand. But what domains are covered? Good, Evil, Chaos, Law, Air, Earth, Fire and Water. Editing and formatting are top-notch, I noticed no significant glitches. Layout adheres to Frog God Games’ two-column full-color standard for the series, with nice, original b/w-artworks. The pdf has no bookmarks, which is a minor comfort detriment. Uhrgh, another domain-book? To say that I was not excited for this would be a serious understatement. Well, guess what – this is absolutely glorious. Hal Maclean’s eminent domains are precise, varied and add whole new tactical dimensions to the domains, rendering them more distinct and exciting – the options provided are varied, fun and brilliant. They do not cut corners, use no cookie-cutter designs and use rules in a creative, fun manner. …and my one complaint here is that we need more. In fact, I want *ALL* domains covered with this simple, elegant and fun system. This is an unexpectedly awesome pdf, well worth 5 stars + seal of approval. We need sequels. That’s right: Plural. You can get these cool options here on OBS or here on tabletoplibrary.com!